Following Argentina football team’s brandishing of a banner stating that the Falklands, or Las Malvinas, are Argentine, Tomos Knox goes on the trail of football, exploring the Beautiful Games’ influence on the islands. Football has been popular there since the early 20th century, and the islands boast a national team, indoor football and a youth setup. However, the local league is not active at the moment, as local FA Chairman Michael Betts explains. “The league hasn’t been disbanded as such, but the Football Club decided not to organise in the last few years due to the inadequate football facilities that we currently have in the islands”. The disadvantage of not having a league on the islands is that promising players don’t have the chance to develop their skills in a competitive division. Also, the lack of a league has affected the national side, who are struggling to find new players, due to the lack of football activity on the Falklands. The national side play friendly matches against visiting Navy ships, as well as military personnel and employees of the contractors at the military base according to Michael. Michael Betts has played for the Falkland Islands a number of times, first drafted in to the squad at the age of 15! After 3 Island Games, the last being Bermuda 2013 in which the Falklands walked away with the Small Islands Cup, triumphing 2-1 over Froya, a Norwegian island of 4,000 inhabitants. 9.8 percent of the Falkland Islands population is made up of Saint Helenians from the South Atlantic island of Saint Helena, famous for being Napoleon Bonaparte place of death. So it would make sense that footballers from St Helena have represented the Falklands internationally, with Adam Glanville and Jeremy Henry among the most recent Saints to represent the national side. The Saint Helena population on the Falklands had their very own All Saints side a few years ago, Michael says. “There was an All Saints team in the football league and they had a very strong team. The core of that team did play for the Falklands national team and have played an important role.”. Unfortunately, when the league stopped, so did the All Saints, and while football on Helena was blossoming, 2011 signified the end of a local league on the Falklands, or temporarily, at least. However, Michael and the FIFL are looking towards the future, and the dream is to have an artificial football pitch. 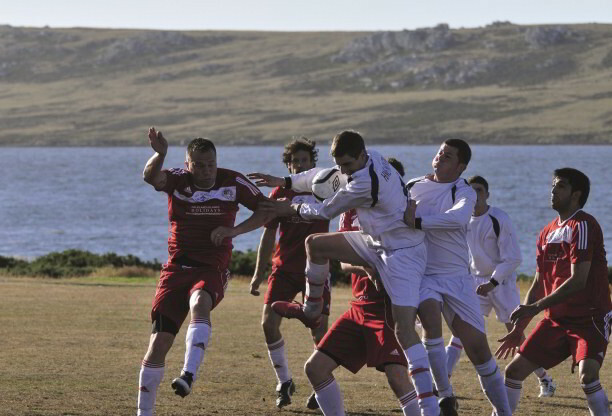 “The Football Club hope that the Falkland Islands Government considers investing in sporting facilities in the islands as the current football facilities are not ideal.” Michael believes that football could thrive again, and the pitch could be the foundation to footballing success for the Falklands. Sadly, football on the Falklands can never thrive at the highest level, FIFA are not even willing to consider the possibility of the Falkland Islands joining, due to the politics in South America. So for the moment, Falkland football enthusiasts will have to stick to the bi-annual Island Games, and the proposed British Overseas Territories football tournament that could see the Falklands pitted against South Atlantic rivals Saint Helena, Tristan da Cunha or Ascension Island. It could also see them playing Gibraltar, who have recently joined UEFA, or Montserrat, who are established FIFA members. Lack of funding will make this tournament very difficult to turn into a reality, but it could see the Falklands finally playing a real national football team! Click on Tomos’ name above to follow him on Twitter.